Offering a large rebate can draw consumer attention, but not always in a good way. Sometimes, a rebate program can attract the attention and energies of a criminal element, necessitating the need for incentive fraud detection as part of your overall incentive planning. According to industry insights, the estimated fraud in an incentive campaign is 2.5% of total claims. With an average of 15,000 claims a week that’s approximately 375 claims that are fraudulent, multiplied by the average amount of a claim being $100-200, you’re looking at a loss of over $56,000 [i]. Although internal action can deter some misconduct, implementing a good fraud detection engine can ensure your brand stays secure and alert. Here are three elements of a high functioning incentive fraud detection engine within a channel management platform you need to consider. 24%[ii] of customers have filed for multiple rebate claims on a single product. Sure, there is a good chance that the customer purchased that product multiple times, but how can you be sure? Rebate fraud often involves the replication of serial numbers, proof of purchase, or other identifiers to make one purchase look like multiple transactions. This allows for that customer to receive a larger payout and for you to lose out on ROI. A great incentive fraud detection program will be able to identify data anomalies across various avenues of your channel management platform, singling out suspicious claims, and flagging them for investigation. 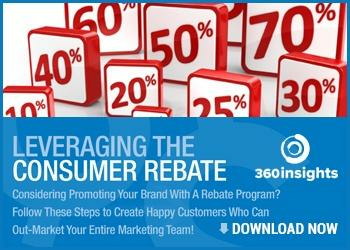 Are you sure your customer is eligible for your rebate? 32%[iii] (taken from the appliance vertical) of customers get declined every year for not being eligible – whether intentional or accidental – it can be difficult to detect when employees are manually sifting through claim data. This form of fraud negatively impacts your return on investment immensely and puts strain on staff. A leading incentive fraud detection engine can effectively combat this. It can extract meaningful data from forms completed by customers, automatically comparing rebate program guidelines. This allows you to quickly identify eligible and non-eligible claims, enabling your staff to focus their time and energy on important matters, such as ineligible or suspicious claims. Consumers need a clean, intuitive rebate experience. An industry study revealed that 57%[iv] of consumers will continue doing business with a company because it is convenient and easy to use. People will ignore a rebate if it appears to be too complicated to complete a claim, which can be detrimental to your brand. It should be easy for customers to file accurate information without running into any issues. Frustrations that arise from a complicated and slow rebate experience can translate negatively on your brand and damage your ROI. In addition, unnecessary complexity can lead to a higher rate of user error inevitably taking your staffs time and energy away from inspecting fraud attempts. A great fraud detection engine offers awareness, automated eligibility verification and streamlined interfaces that allow the software to identify obvious issues without a great deal of human input. This allows your staff to allocate they’re resources to more pressing or complex issues, leading to significant gain when it comes to confronting fraud. We process 30,000 to over 1,000,000 claims per year depending on the client’s volume. From a manual random audits perspective, your chance of uncovering fraud is 1 in 30,000. Companies lose billions every year as a result of misrepresented claims, not to mention the time and money expended trying to stay ahead of fraud schemes. Digital technologies are fundamentally altering how rebate programs are managed, and in the case of fraud prevention, it’s moving mountains. With a proactive fraud detection engine, your organization can stay more alert, gain momentum and ultimately drive revenue. [i] Fraud: The Most Overlooked Oppourtunity. Digital image. 360insights, 2014. Web. 27 Feb. 2016. [ii] Fraud: The Most Overlooked Oppourtunity. Digital image. 360insights, 2014. Web. 27 Feb. 2016. [iii] Fraud: The Most Overlooked Oppourtunity. Digital image. 360insights, 2014. Web. 27 Feb. 2016. [iv] Marketing Sherpa. Customer Satisfaction Research Study. Rep. no. 1. Jacksonville: Marketing Sherpa, 2016. Print.